Every now and then I run across one that sticks with me, like this one above. There was something about it. It spoke to me. I can’t tell you what it was, but this feeling just hit my gut, something deep within me. Depth. A depth my eyes couldn’t see, but my heart could feel. I screen shot it and have kept it on my desktop. I pull it up every now and then, and weirdly, it still has the same effect. I have left it open all week. Typing away contently on my notes or working on curriculum, I find myself glancing over at them, letting my eyes linger. I feel a smile slowly spread across my face. They almost feel like old friends. I know, that sounds kinda creepy, right? But I do, there is a familiarity there. I am drawn to them. What is it about these two that entertains me so? Is it the brightness of her pink blouse that seems to radiates what her heart is feeling, a hint that after much pain and loss, life is creeping back in? Is it the curmudgeonly expression on his face as he barely glances over his paper? Is he attempting to trick the world around him into thinking he barely cares what conversation dances around him, while all the while hanging on every word? His proper attire and spectacles fitting a character worthy of a great writer. But, there is more to him, than this exterior he puts forth. What made him reach out her? Why then? How does he really feel about this bud of new love? As I let these thoughts just hang in the air, I am keenly aware of what has grabbed hold of me. Its the unplanned. Unexpected. As if they were surprised by joy. It gives me hope. Hope of more joy that is yet to come. Oh sisters, have we forgotten that? Have we forgotten, that often when we least expect it…. …we just might be surprised. 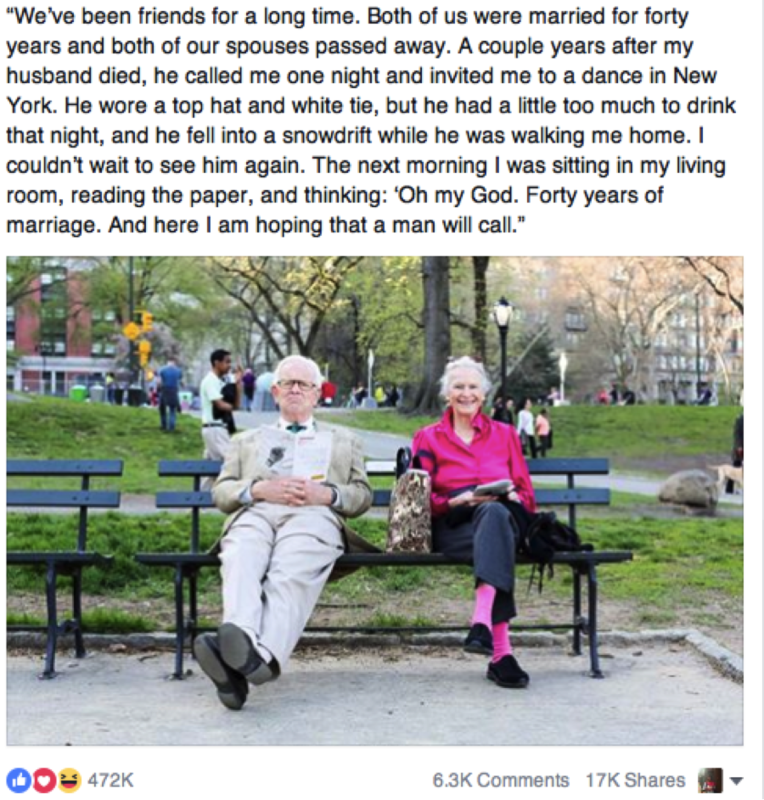 40 years of marriage. Aged. Loss. When they least expected it. Joy. My prayer for you, dear sisters, is that hope will grab hold of you once again. Hope in the unexpected. Hope in life. Hope in our Lord, who does not leave you without joy. That is his promise to you.